Palouse Watercolor Socius - About PWS. Visit us on Facebook! About PWS. Visit us on Facebook! PWS welcomes members of all artistic skill levels, from beginners to advanced. Beginning artists are encouraged and mentored by the group and invariably find their paintings improve over time. At monthly meetings, members are invited to share things they’ve learned about all facets of painting; including composition and perspective, special watercolor or other water based media techniques, characteristics of brands of paper and paint, and new art products. Members volunteer to bring their paintings for critique. This is an excellent learning opportunity for all, and is one of the most informative and fun parts of the meeting. Afterwards, many of us have lunch together at a local restaurant. PWS has annual exhibits at Artisans at the Dahmen Barn in Uniontown, and in Moscow's annual Artwalk events. In 2013, we co-sponsored a four-state regional show at the Prichard Gallery in Moscow; and in June 2017 assisted the Center for Arts and History in Lewiston with a regional juried show and workshop. See our Exhibits and Workshops page for more information and photos of the award-winning paintings. Our members include both beginning artists and those who exhibit at shows sponsored by PWS and other art groups and galleries throughout the region. Visit our website’s members’ pages for photos of some of their work. Plein air outings have become popular in the last few years, and PWS invites artists working in any media to join in weekly plein air painting (weather permitting). 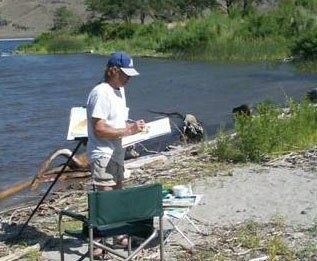 One of the founders of the plein air group is the late Nick Bode, pictured below.